Think you might want to be a forensic scientist when you grow up? This book is for you! First, learn what forensics is and how it came to be. Then, peek inside the daily lives of the real crime scene investigators, forensic specialists, and research scientists that help solve crimes every day. Includes insight into real cases and plenty of info on what it takes to do these important jobs. Part of the STEM In the Real World series for grades 3-6, Forensics includes infographics, primary sources, and plenty of prompts, perfectly aligning with Common Core science standards. 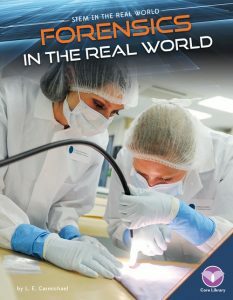 This is my fourth book about forensics, and the most practical one to date. If you want to know how to be a forensic scientist, and the difference between CSI on TV and CSI in real life, this book is for you. Whenever I research a topic, I find awesome info that I just don’t have space to include. Writing several books about a topic is a good cure for this, because stuff that didn’t fit last time might fit this time. For example – want to know how a real forensic scientist explained brand new bullet science in the 1930s? Check out Chapter 2!